It’s been a year now since I first started actively seeking out international sf and reviewing it here on SF Signal, and the thought that I might otherwise have missed these books depresses me. The Three-Body trilogy? Dendera? A Planet for Rent? I can’t imagine these stories not being in my life. I’ve found myself reading Polish, Japanese, Finnish, and other sf in translation and thinking not just about the content but about the country of origin- its political, social, and economic realities; and what kinds of decisions the translators had to make to stay true to the stories while simultaneously making them understandable to English-only readers like myself. 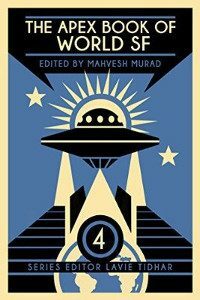 The stories in ABWSF4 reflect the myriad traditions and histories that together make this planet an interesting place to live. And with a good mix of pieces written in and translated into English, this volume also reflects the ways in which English itself has moved across borders. Whatever the original language, each of these tales invites us to consider how we would react/adapt to an unfamiliar reality, one in which people can devour themselves or exist without a shadow, or even explore far-flung worlds that we can only dream of now. And while I enjoyed all of these pieces, I’ve chosen four in particular to highlight here because they engaged my imagination the most. They made me laugh, shudder, re-read…you get the idea. Taiwanese writer Sabrina Huang hooked me with “Setting Up Home” (translated by Jeremy Tiang), a work of magical realism in which objects appear in one man’s apartment seemingly out of thin air. A sofa, a bed, a coffee-table: each of these objects simply “arrives,” culminating in a woman who is supposed to be the man’s bride. Turns out, the man’s dead father has been pulling the strings, so to speak, and setting his son up with everything that he supposedly needs to lead a solid, “normal” life. This parental tendency to want to control a child’s life, even into adulthood, is universal; it’s just that this particular parent goes…well…a little too far. Huang builds up this brief but engaging story with a steady hand and perfect pacing, such that the reader, like the man in the story, begins to take each of these gifts for granted. Not surprisingly, Thomas Olde Heuvelt’s “The Boy Who Cast No Shadow” (translated by Laura Vroomen) was the next to jump out at me, given its exuberance, wit, and strangeness. In the world of this story, it’s possible to be born without a shadow, or with a glass body instead of one composed of blood and bones. Heuvelt forces us to think about how we treat those who don’t seem to “fit in” with their communities by showing us what happens when a shadowless boy and a glass boy compare their experiences and even fall in love. Each character struggles with his notoriety and the obnoxious stares of strangers, as well as bullies and hyper-protective parents. The narrative voice is at times cool and sarcastic, hilarious and despondent, and Heuvelt’s deft handling of all of them makes me see why he recently won a Hugo, as well as many other awards. I’ll be reading everything he writes, of that you can be sure. Johann Thorsson’s “First, Bite Just a Finger” is, like “Setting Up Home,” short but powerful. Julia, who sees someone at a party bite off a piece of his own finger, decides to try it, too, why not, right? Well, one thing leads to another, and before she realizes it, Julia’s devoured half of her own body, each bite filling her with a strange sense of elation. We could read this story as a philosophical exploration of our inherent self-absorption as human beings, or we could take it at face value. I find the latter reading much more fun. Finally, “Pockets Full of Stones” by Vajra Chandrasekera fascinated me because of its unique ideas about what alien life might look like. Instead of blue blobs or giant squids, the aliens we might encounter could constitute a signal that can hack into and rewrite the human brain. It falls to one scientist on a relay station to stop the signal from being transmitted to Earth. Much of the story, though, isn’t about aliens or invasion but about family, resentment, and the nature of time. It’s up to us as avid readers of speculative fiction to go beyond English-only American and British fiction and explore what the world has to offer. After all, what better way to learn about another culture than by reading the stories of its most imaginative and engaging writers?